I used to get very anxious about Christmas gift giving. Finding the perfect gift for everyone on my list became an obsession and I was often guilty of being at the mall on December 24th at 4 o'clock in the afternoon. During my university years, however, I had an epiphany and began making identical gifts for each friend in order to make my life easier. One year, it was pillows. Another year, mosaic picture frames. My favourite was the year I made personal sized pavlovas for everyone. The tradition fell dormant for about a decade because medical school and residency made me lazy in terms of creativity and friendships. Nowadays, I am appreciative of my opportunities to foster both and take much joy from my annual edible gift production. 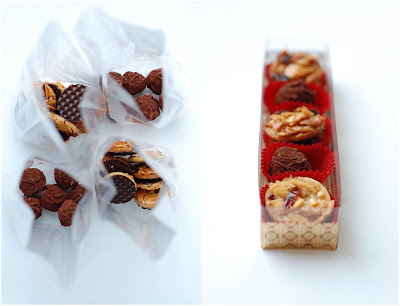 On the menu this year were two items, mini-Florentine cookies and milk chocolate passionfruit caramel truffles. The Florentines are very cute, about the size of a Toonie, and textured with dark chocolate on the reverse. The truffles turned out slightly different than I had planned, but are nonetheless, exceedingly soft and delicious. The original ganache recipe used white chocolate and was meant to be piping consistency so next time I will need to make it even more firm to make my life easier during the rolling and dipping process. Note to self: buy truffle shells next year. Since my frugality causes me to only make exactly what I need, when I do have leftovers, I make it a challenge to find a good use for them. For example, having a leftover blob of lime marshmallow (primary use to be revealed at a later date), the next logical step was to make a small marshmallow Christmas tree, decorated with leftover Halloween candy, leftover fondant daisy/star, and leftover silver dragées. Consider it a gift to you as a small token of thanks for your interest in my little blog in 2008. Happy Holidays! This week, in between Christmas parties, wrist exercises, and skating with Vancouver 2010 Olympic mascots, I managed to complete a colourful baby block themed cake for Bailey Rose, the newest addition to my friends Erik and Paige's family. You may recall that big sister Maya just recently celebrated a birthday too. 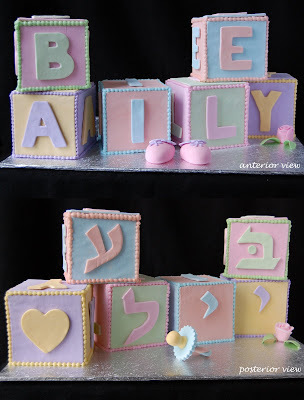 The cake was for the traditional Jewish naming ceremony which meant that in addition to her secular name Bailey, her Hebrew name was to be included on the baby blocks. Luckily, I was given a brief gentile Kindergarten level introduction to the Hebrew alphabet, learning that words in Hebrew are written from right to left. Because Bailey's Hebrew name actually only has five letters instead of six, a yellow heart was inserted and is not a Hebrew letter! Each block was a 4 inch cube composed of chocolate cake and either vanilla mousseline or mocha mousseline. I was debating whether to cover each cube with rolled fondant or to make pastillage tiles and decided on the latter because I wanted to achieve a more solid appearance and the drying time needed for pastillage before assembly was actually advantageous for my work flow. 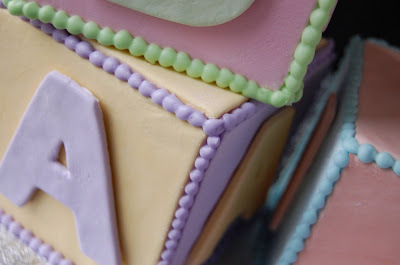 Each tile was caulked together using royal icing and was so effective that during the cake cutting, most blocks remained intact after being lifted off the cake cube. It was a big bustling party, centered around a beautiful Jewish tradition where the newborn is passed from the oldest generations through to the parents and the derivation of Bailey Rose's name was explained. For me, it was an opportunity to test my self-confidence amid a houseful of friendly strangers who perhaps knew of my previous life in ophthalmology. Confirmation of my unusual career switch was akin to revealing an urban legend to be actually true, "that doctor who became a pastry chef". The cake was very well received (especially my excellent Hebrew letters) and one nice man even joked that he liked my cake so much he wanted to convert me to Judaism! Unfortunately, eight years of Sunday School and an unshakable love of Chinese BBQ pork would prevent this from happening. Although, I was most impressed by the massive 3 feet long challah which was so soft and delicious and perfectly braided. Mazel tov מזל טוב‎ ! !